Your magical journey begins in Te Anau with a relaxing cruise to the glowworm caves onboard our modern catamaran the Luminosa. Relax on board, enjoy the scenery as we cruise to the western shores of Lake Te Anau. 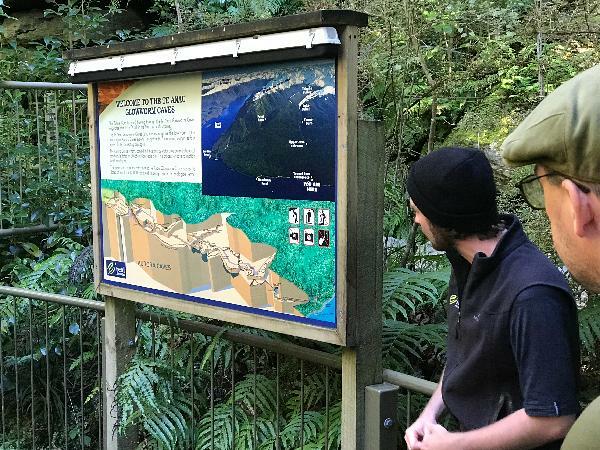 There is no road access to the Te Anau Glowworm Caves. Upon arrival at the glowworm caves, you'll meet your guide and be able to view the interesting displays in Cavern House and learn about this mysterious underground world. Venturing underground in small groups, you will soon appreciate that the Te Anau Glowworm Caves date back over 12,000 years and are home to a vast network of twisting limestone passages filled with sculpted rock, whirlpools and a roaring underground waterfall. Your experienced and friendly guide will share the fascinating history of the cave and point out interesting highlights along the way. The highlight of the tour is when you transfer to a small boat in a secluded grotto where hundreds of tiny glowworms perform a dazzling display above you - a truly extraordinary sight. There is time for an optional short nature walk in view of the lake edge. After a dazzling tour you can reflect upon your experience on the return cruise to Te Anau. Please Note: Some bending is required at the caves entrance and steps are involved. Departs: Real Journeys Visitor Centre, 85 Lakefront Drive, Te Anau. Te Anau is a 2.5 hour drive from Queenstown, so ensure you allow sufficient time to travel between the two locations. Suitable for all 5 years and over. Child rates apply 5-14 years.Child rates apply for 5 - 14 years and infants 0 - 4 years carried free. A good experience. Great staff. Can't show any photos as you are not allowed to take photos in the cave. Good trip. Crew on boat very informative on trip up Lake. Presentation before entering the cave told us a lot about the life of the glow worms. Tour very well done and the work that has been done thru the cave is a credit to all. Well worth doing. Simply awesome adventure in the Te Anau Glowworm Caves. Your message has been sent to Te Anau Glowworm Caves Experience & Cruise. You should hear from them shortly. Please note: all responses will come directly from Te Anau Glowworm Caves Experience & Cruise, and not the team at Bookme.